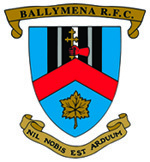 Ballymena U14s overcame a strong Rainey team 19:5 to reach the semi finals of the Ulster Cup on Saturday 13th April. They now move on to the semi finals for the second time in as many years. On the same day at Eaton Park the U16s fought out a draw with Hinch in the quarter finals, but were eliminated as Hinch scored more tries that the home team. This was a gripping game with the home side winning at half time but Hinch played their way back into the game, scoring with minutes left on the clock to level the scores and put Ballymena out. This is a disappointing end to a great season for the u16s who as well as making it to the quarter final of the cup reached the final of the League Play Offs earlier this year. The U18s, who sealed their place in the semi finals with an away win at Banbridge, and U14s are now one game away from a day out at the Kingspan and face semi finals against Randalstown and Banbridge respectively on Saturday 20th April.